Dubai, UAE: Arabian Automobiles Company, the flagship automotive division of AW Rostamani Group and exclusive dealer for Renault in Dubai, Sharjah and the Northern Emirates, has launched the All-New 2017 Renault Koleos, its International SUV Flagship model. The Koleos is well-placed to capitalise on the growing global market demand for SUVs, as this new Renault benchmark is anticipated to win over customers that are looking to indulge in this segment. The new automobile features taut, powerful and muscular exterior lines, which create a sturdy and imposing vehicle with a touch of panache. The All-Mode 4×4-I technology employed will see an easy-to-use system on the dashboard, which offers the choice between 2WD front-wheel drive, 4WD AUTO and a third mode called 4WD LOCK, which enables the driver to select a permanent all-wheel drive. With the addition of a 2,705 mm wheelbase, it is amongst the longest in its segment. “The concept of the new Koleos is rooted in the design pillar ‘EXPLORE’, which exudes robustness and a taste for adventure. Through this innovative vehicle, that delivers unparalleled safety features and driving comfort, the Koleos marks the direction which the Renault brand is advancing towards. The All-New International SUV Flagship model sets a benchmark for Arabian Automobile Renault brands, and personifies the excellence that we aspire to.” He added. Renault’s designers provided expression to these qualities through such vehicle in the form of a smooth and flowing line stretching from the top of the dashboard to the rear of the armrest. Drivers are empowered by an extensive selection of safety focused aids, all of which can be controlled via the R-LINK 2 tablet, including Active Emergency Braking System, Blind Spot Warning, rear view camera, front, rear and side parking sensors and Easy Park Assist. Strips that run from the head lights along the full length of the wings give the front end of the car, a lengthy appearance, radiating dynamism and elegance. The R-Link 2 tablet also controls a fully-integrated Bose audio system including 13 high-performance loudspeakers that deliver a rich, clear and balanced surround sound quality. 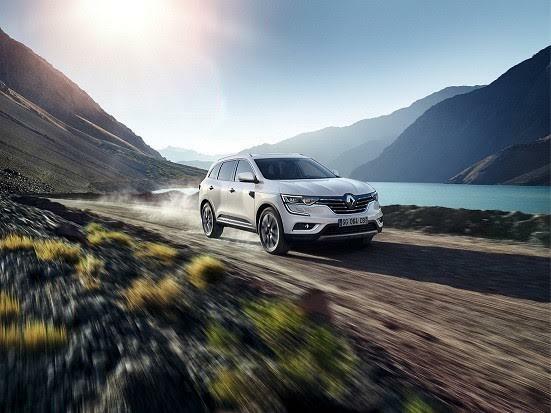 Those interested in the latest Renault model are encouraged to call 800 RENAULT (7362858) or visit their nearest Arabian Automobiles Renault Showroom where they can test drive the Renault Koleos, to discover the all-new features for themselves. Alternatively, Renault now provides the option of participating in a live sales demonstration of the car through the use of its all-new virtual showroom. Customers can then proceed towards pre-booking their new Renault vehicle, all from the comfort of their home. Live sessions of the virtual showroom are being hosted on October 23rd, 25th and 27th.